At last! A sprinkler that disperses water farther and more evenly, uses 1/3 less water and lasts for years! The only sprinkler you'll ever want to use and the last one you'll ever buy! 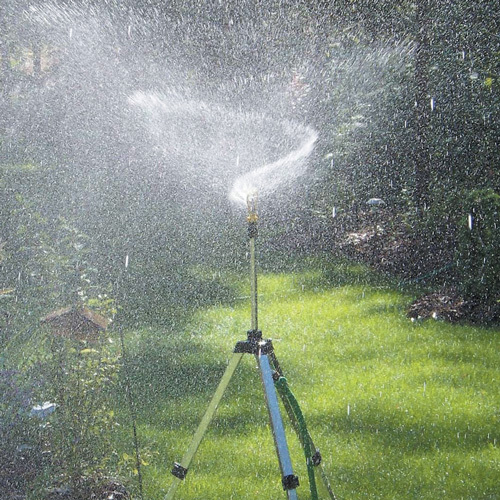 This tri-pod ecological sprinkler outperforms any other sprinkler you've seen. The heart-shaped head shatters water droplets into a fine rain/mist that won't damage plants or seedlings. Plus, it creates a 6'-50' diameter spray for coverage of up to 1900 square feet, works with high and low water pressure and will not clog. Unique design has only one moving part so it lasts for years. Adjustable height. This is a customer return. Customer returned items have a 7 day return policy.